I don't speak Chinese (at least not more than a handful of words). I can't read Chinese. But when I travel to Asia I have my phone which does. With a little practice it's possible to look at a Chinese character, draw it on your Android phone, and have it translated - whether you have a data plan or not. Having family ties to Taiwan I'm focused on Traditional Chinese through most of this document, however these methods work well for pretty much any pictographic/ideographic language (as well as non-Latin alphabetic languages like Korean) with some minor changes. I have been able to sketch Simplified Chinese, Korean and Japanese characters with these techniques, but I have the most practice with Taiwanese. Note that I sketch, people who know the language write! Note that this is really geared towards people who, like me, have no idea what they're writing. If you're a native Chinese speaker or skilled with the art of writing in any of the Far East languages you may want to take this with a grain of salt. I've been using a Motorola Droid X (the original). I think this technique works best with a larger screen, the X sports a 4.3" screen and even then the drawing area is a little tight. A tablet would probably be even better, especially if you can get access to a stylus, but also note that my artistic ability is very poor so your mileage may vary. Since the original writing of this document I've moved to the Galaxy Nexus which behaves in pretty much the same manner. There are two components you'll need for your phone or tablet. You'll need an input mechanism and a dictionary (the latter is optional if you actually can read/write the language you're interested in, but then you've probably already got a preferred method of input anyway). I use the Hanping Chinese Dictionary which is nice in that it's off-line and seems fairly robust. It's available in both free and paid versions. Initially I balked at the $10 price tag, then I looked at the price of a paper dictionary and figured it was worth it. Because it's offline you don't need a data connection for it to work - good news if you don't have a local SIM card. 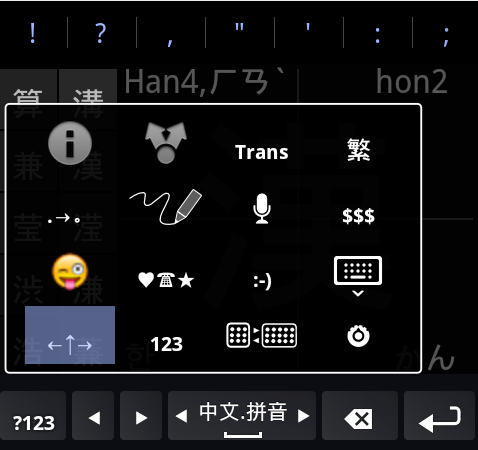 The Hanping dictionary now supports a native drawing interface for entering in Chinese characters. However, it seems like it may rely on some online feedback to perform the recognition in at least some cases. While the drawing area is nice and large, I don't trust it without a data plan and it's not very convenient for entering text outside of the dictionary (technically you can copy and paste the characters in the pro version, but that can get very annoying). Enter MultiLing (formerly amusingly named "HanWriting"). This is a nice general-use keyboard that supports a handwriting interface. HanWriting was a simple IME that supported Chinese input. MultiLing adds a bit of complexity to the installation but in return adds a lot more languages and input styles. To install MultiLing you'll need to first download the MultiLing Core App. This is a standard IME that you'll need to activate, if you've never done this before here are some generic tips. Now you can pick and choose the languages you want and install them from the Market. I installed some European languages as well as English, but to get the Chinese character handwriting module you'll want HanWriting Plugin. It may be a good idea to only install languages you can recognize at this point, you can always add more later. Next you need to activate the appropriate languages. At a minimum HanWriting should be activated. You can do this by going to the Android home screen, clicking the Menu button, touching Settings, selecting Language and Keyboard, and then finding MultiLing Keyboard Settings. Touch Input Languages and select HanWriting. 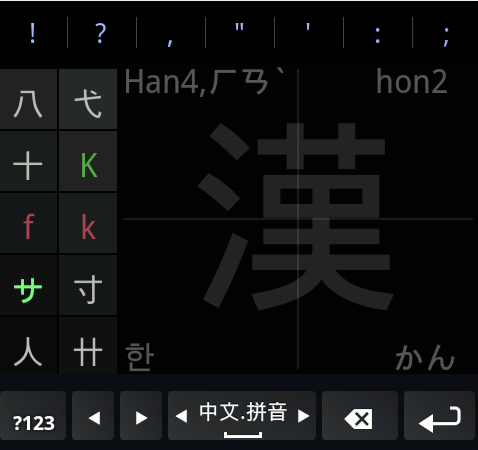 The screenshot below has HanWriting highlighted in yellow, with Pinyin and Japanese also selected. When selecting languages it's a little difficult for foreign devils such as myself to figure out what's going on. I created a little table to show the different versions of the language input that are available, as well as the characters for Korean and Japanese. Note that 中文 translates into "Chinese" so most of these are just different Chinese input methods. I've placed these in the order of appearance in the MultiLing list. 日本語 Japanese To enter Japanese characters. Once you've got MultiLing running, you can long-press the 123 button and access a quick settings menu. Selecting the pen symbol will enable handwriting mode, which looks like this. As another tip, long-press the space bar to change the language. One last setting you may need is to select simplified vs. traditional input modes. When in doubt, most of mainland China uses simplified characters while Taiwan, Hong Kong and Macau use traditional. The symbol for Traditional is 繁 while Simplified characters are represented by 简. You can access this by long pressing the 123 button and selecting the symbol in the upper right if it doesn't say what it should. You may be wondering about those other icons when you long-press the 123 button. Obviously the best way to try this out is to just play with it and see what happens. Below is a little table of what each icon does. Now all you need to do is sketch characters to get them translated, right? Not without a little background information. Let's start with one of the more simple characters, 人 or "people." I don't know about you, but my first impulse is to start at the lower left and draw this with a single stroke. It turns out there are rules to writing Chinese characters that you need to follow for handwriting recognition to work properly. There are plenty of tutorials out there. Some will teach you to write in Chinese, others only show you the rules for copying characters you see. There is some decent overview information available on Wikipedia including animated graphics. Another site with some nice guidelines is available from the California State University at Long Beach. On a computer, the website nciku allows you to draw with your mouse. If you want to convert your characters into Unicode (for HTML, for example), you can use this handy converter.